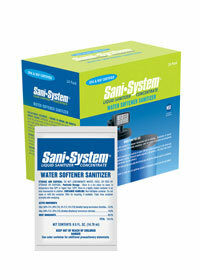 Sani-System Liquid Sanitizer Concentrate is the industry's only NSF & EPA approved sanitizer for use in water softeners and reverse osmosis units that delivers reliable and effective results every time. Sani-System is proven to kill 99.99% of harmful bacteria without the use of acids, chlorine or oxidizers that can harm the systems parts, equipment and resin. Each packet of Sani-System Concentrate sanitizes equipment in just 60 seconds and comes in exact pre-measured doses for both RO units and water softeners. The products no-mess ease and accuracy address the industry's most important sanitizing concerns. Sani-System is effect, efficient and easy to use. Available for use in Reverse Osmosis Units and Water Softeners. Brine Well Water Softeners: Pour the entire packet of Sani-System into the brine well. If the softener unit does not have a brine well, pour the product directly into the salt tank when the salt level is near empty. Manually regenerate the softener. Regenerate a second time if necessary. Salt-In-Head Water Softeners: Open the top and drain the freeboard water to about 1/2" above the resin bed. Pour in the packet of Sani-System and close the water softener. Proceed with the normal downflow regeneration process. Reverse Osmosis (RO) Units: Begin by shutting off the water supply to the RO unit. Remove the membrane and all of the filters (be sure to store the filters and membranes in a safe place to prevent damage.) If necessary, turn off the pump. Open the pure water faucet and depressurize the system. Once depressurized, pour one entire packet of Sani-System RO Unite Sanitizer directly into the first main housing unit and reinstall the cartridge. Makes sure the pure water faucet is closed and proceed to turn back on the water supply. Allow the system to refill with water (this should take approx. 5-10 mins without the filter or membrane installed. Once the system is full, allow to sit for 60 seconds and then flush the system twice. Once finished, replace or re-install the filters and membrane.